Here is photo Intern Bobby is taking at same time I am seeing vision of Condi in blizzard. Is difficult week. During severe blizzard, pack of rabid yenot (Intern Bobby is saying this is like American raccoon) is again attacking Commie Football headquarter in try to kill, maybe eat Bobby. Attack is also damaging steam-power server and many critical equipment for running website. Many is meeting death by bayonet, but is too many yenot. One night, hungry creature is chewing through petrol line, causing fire. I am instructing Bobby to rescue computer equipment and critical electronic files, but he is running to hide in latrine. For this reason, headquarter shack is burning to ground, like 1812 Fire of Moscow. Is good luck for Bobby I am rescuing few computer equipment, bayonets, and provision for long journey on feet through cold forest to secret, secondary headquarter. For critical electronic files, is lucky I am using storage/backup solution in Internet cloud. Is taking three days to make journey in deep snow. I am giving extra food to Bobby. If intern is dying during internship, is possible for many legal troubles. While carrying 40 kilo in equipment, I am falling into crevasse, injuring leg and lower back. Am using Ethernet cable as rope and harness for lift out myself. Then, I am seeing Bobby is having bad shivers, so I am giving extra clothing. For this reason, I am later having frost-biting and needing to remove dead, gangrene skin from lower leg, with bayonet. Later same day, I am asking Bobby for small drink of vodka to make warm inside stomach. He is instead giving me jar of petrol. Is saying “by accident.” On next day, I am seeing many strange vision. 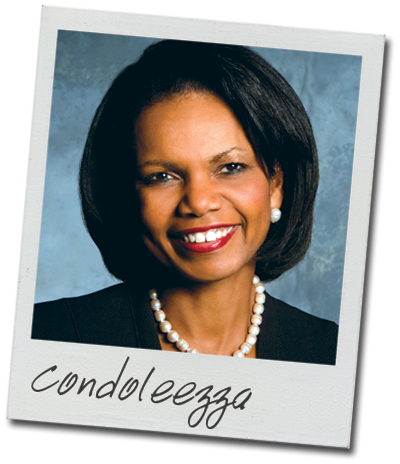 Most vivid vision is Condoleezza Rice (see photograph above), who is saying to me that secondary base is in slight different direction. Condi is also reading Manifesto, and is agreeing Commie Football is superior system to unfair College Football Playoff, and is making secret plan: as CFP committee member, Condi is using lethal combination of superior intellect, diplomatic expertise, and classical piano playing to agitate for 16-team playoff system. I am explaining of additional necessary reforms to college football schedule and organization, but Condi is not listen. Instead is playing beautiful piano medley of music by greatest composers of all times, Tchaikovsky and Rachmaninoff. Condi is like angel…. But pleasant experience is ending sudden, when Bobby is loud falling on rucksack containing metal items and many jars of glass. Is including fresh water for drinking, waste water to prevent wolves from tracking smell, and last of petrol. Great noise and foul odor is attracting attention of nearby wolf pack. Intern Bobby here. I flipped the lights on in this chamber and I was all like, whaaaaaaaa? Can you say “goryachaya vanna”? But with help of Condi vision, we are soon near location of hidden trap door to new Commie Football headquarter. Is difficult to find during great blizzard storm, but Bobby is helping with discovery when falling three meters through rusted ventilation cover into privy chamber. Because fire disaster is in December, after end of regular season, is yet much time to make total recovery before Commie Football playoffs is beginning in January. Furnace at new headquarter is frozen. I am ordering Bobby to chisel ice, dig fresh coal from small mining chamber, and build fire in oven of furnace. But first, lazy Intern Bobby is having to halt current activity – endless feast of emergency food supplies from cold storage chamber and making loud singing in hot tub! Logo for College Football Playoff is being based on cave drawing made by Neanderthal many thousands of years ago. For many years, angry American college football fans is arguing about best teams playing for championship. Is ancient tradition, older than sport itself, encoded in DNA of human species. Fans is like poor peasant nevol’nik, forever hungry. Is happy to boil and eat leather from own dirty shoe, because is tasting better than der’mo goulash older ancestor is eating. College Football Playoff is making big promise to fix system and give to fans best format to determine one true champion at end of season. This is lie! CFP is simple repeating of history, with purpose to make most money for wealthy capitalist dogs! Even innocent, true angel Condoleezza is succumbing to seduction! Below you are reading history of failure to determine yearly champion of American college football, and learning truth about many flaws of CFP system. Then, you are accepting of Commie Football 16-team playoff as best possible solution for determining of true champion! Here is old KGB photo showing famous American gangster Albert Capone enjoying laugh and celebration with illegal alcoholic drink, after Illinois Fighting Illini is being named as 1927 national champion team. So, the other morning I’m up on the roof of the shack, clearing off like THREE FEET of snow, ‘cuz it’s covering all of the vent pipes and the shack is like a death sauna – completely filled with steam, smoke, and carbon monoxide. I’ve been feeling paranoid lately anyway, just because I keep seeing things in the woods (like this) and hearing weird noises and stuff. Plus, Georgy kept me up late, drinking his homemade vodka and telling me stories about the time he tracked a rabid bear for five days and eventually killed it with a sharp stick, all because it ruined his babushka’s cabbage crop. Anyway, so I’m more than a little out of it. I go to move these heavy, ice-packed branches off the roof, when suddenly – something tackles me. RACCOON ATTACK! I start screaming and curl into a ball, and there’s like three or four angry raccoons jumping on my head and back, hissing, biting, scratching (lucky I had on about a million layers). Georgy comes flying out of the shack, and I hear this metal “shhhiiiinnng!” sound, followed by squealing. I hear Georgy yelling “you know, you know!” and I’m all like, “YEAH, I KNOW! THEY’RE KILLING ME!” but I guess Russians call these critters “yenot” (or something like that). Anyway, Georgy goes all Crouching Tiger, Hidden Dragon on them with his bayonets. He keeps the fattest one to make a stew out of it. And then (and this is the type of guy he is) he gives me an early Christmas present – a new yenot-skin cap! BIRTH OF SPORT: As this is explaining previous, sport named “American football” is invention of Soviet Union. Is having origin when peasant farm workers is throwing potatoes as practice for grenade assault on Tsarist armies during Revolution of 1905. Vladimir Lenin is writing first rulebook, which is then stolen by American spy Walter Camp, who is introducing sport to United States, where thirst for blood is national drink. ROVING FREAKSHOW: In years before conference alliance and meaningless bowl game, each college football team is like wandering circus, free to put on show with any other team. But this is era of Great Depression. Roads is clogged with mud, and horses is having many diseases. Powerful team is sometimes playing weak junior college just over next hill, who is not having enough players and is forcing children with polio on roster. Many teams is finishing with unbeaten record every season, then having argument via carrier pigeon over who is champion of entire country. DIRTY MONEY: In era of Prohibition, American gangsters is having many strong alcohol drinks at illegal nightclub and making debate over who is best college football team. First “polls” is propaganda to trick rival gangster to make large money bets on wrong team at speakeasy. FAULTY MATH: Early mathematical systems of 1960s for determining champion is too simple, like creation of young child with pinky finger in pile of coal ash. Many is trying to fix math to award championship to teams from old seasons! America is not having superior mathematician, like Sofya Yanovskaya to solve problem. USA BANK OF STUPID BOWL GAME, BRINGING TO YOU BY MULTINATIONAL TECHNOLOGY CORPORATION WITH IDIOT NAME: Enemy-of-the-people Ronald Reagan is master to proliferation of meaningless bowl games with complex television contracts and arbitrary, automatic conference alliance. Each season, fans is seeing five strong teams not play each other, with each claiming championship! BCS IS MESS: In recent past, fans is thinking complex computer algorithm is determining best teams to play in top bowl games, but truth is this – television executives is making decision at secret luxury resort, basing outcome on immoral games of chance. COLLEGE FOOTBALL PLAYOFF: Is end result of broken history to determine American college football champion. Central committee members having personal and financial bias to favor certain teams is entire system! Argument over best two teams is now even more stupid argument over #5 team in country! Whoever is saying this is true playoff is using spoon to plow field, instead of tractor! PROBLEM SOLVED: In 2012, Commie Football is revealing Manifesto to reorganize American college football and fix broken system of determining true champion. To all true American college football fans – pozhaluysta! Now, here is slogan for chanting at next game: “Chempion reshili putem golosovaniya prisushche nedostatok!” Meaning is difficult to explain. Do not worry about this. Here is popular music video performance of Tomas Petty with sometimes accompanying music group, Breakers of Heart. As Tomas Petty, famous poet from Florida SSR, is saying, “Is waiting that is most difficult part.” For fans of Commie Football, is long, cold wait for January, when superior 16-team playoff to determine champion of all American college football is happening. But is good reason, worthy of long wait! Soviet supercomputer is requiring proper data to determine final scores of Commie Football playoff games, including final scores of idiotic conference championship games (early December) and meaningless bowl games named after banks and corporations (late December/early January). After this, is then time for Commie Football playoffs. In response, here is two words: blah and blah. Is simple. To make round one of playoffs, team must qualify for District Championship game. Ranking in Top Power 25 is very interesting, but is not factor in playoff invitation. To qualify, team must finish at top of division standings. If nyet, then is end of istoriya.